Author Note: Tales from Toonopolis is a non-linear series of "side stories" or other genre-specific adventures taking place in a single section of the cartoon city. This story takes place in Steamport, the section of Toonopolis inspired by steampunk and operates with the tropes of that form of media. It would best be classified as a young adult coming of age steampunk adventure... with my Toonopolis flair! Do you prefer print books to eBooks? Misanthrope Beechworth is available in Jeremy Rodden's Tales From Toonopolis Volume One with five other Toonopolis stories! In Toonopolis: Chi Lin, we meet Misanthrope "Missy" Beechworth, the leader of the Royal Order of Scavengers & Engineers (ROSE). In this novella, learn how a simple toymaker's daughter began her surprising journey to the top of ROSE. 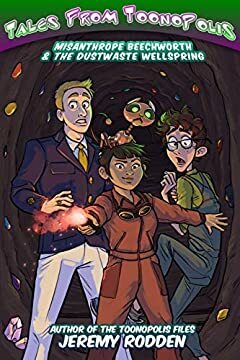 Along with her best friend Rube Silverburg and snobby noble Heinrich von Deutsch, Missy turns a run-of-the-mill scavenging mission turns into Steamport's biggest adventure since The Indefatigable went down over a decade before!